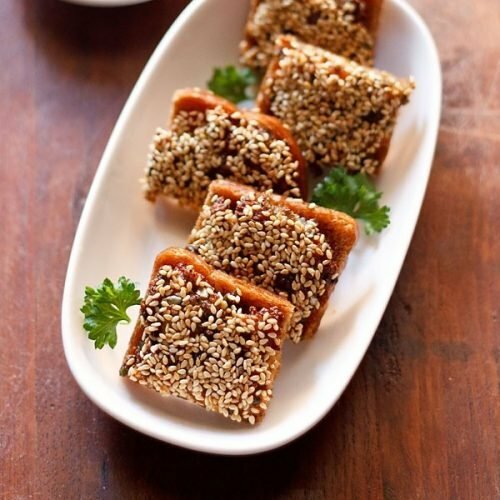 veg sesame toast recipe - indo chinese starter snack of crisp, golden fried toast stuffed with veggies and topped with sesame. boil the potato and then mash it. parboil the carrots and beans. finely chop them it. also finely chop the onions, capsicum, celery or coriander, ginger, garlic and green chili. in a bowl, mix the mashed potatoes, finely chopped carrot, beans, capsicum, onion, celery or coriander, ginger,garlic, green chili, cornstarch, soy sauce, salt and black pepper really well. cut the bread into rectangular or triangle or small shaped squares or even round shape with a biscuit cutter. spread the veggie filling evenly. press it lightly so that the filling sticks to the bread. you can also first spread the cornflour paste on the bread and then spread the veggie filling. then apply the corn flour paste on it. sprinkle the sesame seeds liberally over the paste. press lightly so that they don't fall off. heat oil for shallow frying or deep frying. slid the bread slices upside down with the filling side at the bottom, in medium hot oil. when this side gets browned, turn and cook the other side. you can flip once or twice to get a uniform golden color. fry the bread slices till crisp golden. drain the fried bread slices on paper towels. then slice them if you want & serve sesame toast hot with tomato sauce or chili sauce or schezuan sauce.